When it comes to donor transection, the only way to know for sure is to perform a biopsy. Unfortunately, that is usually not practical. Below is a photo taken by Dr. Cole / Dr. Rose several years ago. It provides an excellent view of what’s happening underneath the skin. Great photo. Thats a great photos. Looks good. » Found this in the archives. » perform a biopsy. Unfortunately, that is usually not practical. Awsome photo. I just wana dip it in some sauce and bite it. So the doctor did fue on the patient and then took out a chunk of the patient’s flesh in order to examine the follicles under the skin? why would anyone let the doctor do that? This one is a keeper, you can even see the fat tissue coating each follicle. » would anyone let the doctor do that? No thats not the case. Common sense tells me they’re using a portion of the strip removed during FUSS procedure. The “strip”. Now slice it up. Dissecting individual follicles is possible. But in my 20 years of my observations, it is my opinion that it is impossible to do so without damage to follicular units suurrouding the target unit. That is why countless guys have massive strip scars and very little to show for it. That is not to deny there are lucky guys out there who have good results compared to the size of the scar and tissue removed. FUE does not have this luxoury. The doctor needs to have the right skills, magnification and tools…and many many years of individual effort in learning how to FEEL their way around a follicle. That is why after all these years, Dr Campbell and I can , with 500 genuine follicular units, provide better results and significantly less damage, than clinics offering many more grafts at a so called cheaper rate. I assume the “bulbs” Woods talked about are the tiny black dots at the root of the follicle, this is what the doctor needs to preserve? I don’t understand the purpose of this picture, is the purpose to show fue transection or strip transection or something entirely different? » This is “Direct Vision”. » Now slice it up. Dissecting individual follicles is possible. » compared to the size of the scar and tissue removed. » FUE does not have this luxoury. » transection or strip transection or something entirely different? » » This is “Direct Vision”. » » Now slice it up. Dissecting individual follicles is possible. » » show for it. » » compared to the size of the scar and tissue removed. » » FUE does not have this luxoury. » » around a follicle. The techs then , hopefully under a stereoscope, start dissecting out the individual follicular units. As stated, you can see the follicle your are going for, but not bulbs behind it, as the blade cuts through. And cutting the bulbs, or transection, is game over. You have just destroyed the follicle. And planting such transected follicles is the FRAUD of the industry. Makes the numbers look good and you can claim megasessions…but it is a con. Complicit “patients” and some clever photoshop does the rest. And FUE in some ways is even worse. It gives a false sense of security while a "plague of locust " punch away at your head, while some assistant stands there with a CLICKER, counting the moment an instrument touches the head, with no regard as to what actually is removed, be it intact follicle, or useless fragment. No regulation, no dissent, and ISHRS buddies stick together. I believe that, if this photo is meant to show the safety of FUE and lack of transection then it should be treated with caution. To some extent the photo is quite deceptive without any acompanying qualification. 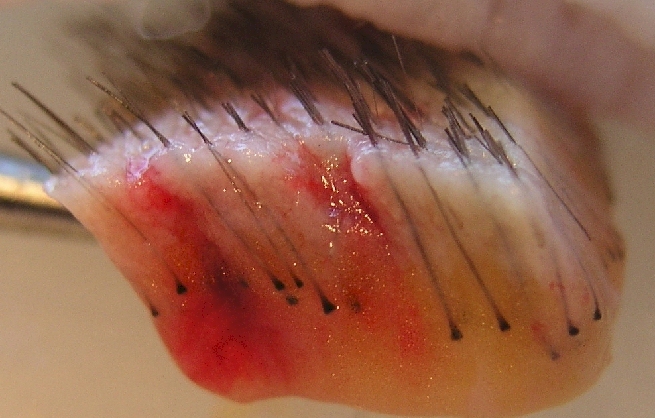 1: It is clear that the follicles extracted by FUE were performed after the strip was removed. Little or no inflamitory responce would be likely in that scenario wheras it could be significant if performed in situ. In other words the surrounding follicles may be effected very diferently when the extraction is performed on the living sclap. 2: If you look at the follicles that can be seen in the forground of the photo then two of thos are very close at the matrix / bulb. Even though they are well peperated at the dermis, it would be imposible to be confident of seperating those be sharp disection without damage. 3: From looking at the photo, it may be that the disection was made only half as deep as the actual follicle and then it was pulled out and this is a common practice in FUE. There can be tearing and pulling that can also disrupt surrounding follicles even though there is no obvious damage. » » Found this in the archives. » » perform a biopsy. Unfortunately, that is usually not practical. » » provides an excellent view of what’s happening underneath the skin. » photo is quite deceptive without any acompanying qualification. » extraction is performed on the living sclap. » confident of seperating those be sharp disection without damage. » disrupt surrounding follicles even though there is no obvious damage. I was going to say the EXACT samething. » » transection or strip transection or something entirely different? » » » This is “Direct Vision”. » » » Now slice it up. Dissecting individual follicles is possible. » » » target unit. » » » show for it. » » » compared to the size of the scar and tissue removed. » » » FUE does not have this luxoury. » » » around a follicle. » behind it, as the blade cuts through. » And cutting the bulbs, or transection, is game over. » You have just destroyed the follicle. » And planting such transected follicles is the FRAUD of the industry. » Complicit “patients” and some clever photoshop does the rest. » No regulation, no dissent, and ISHRS buddies stick together. Dr. Woods good to see that you are posting here. I have a question. Let’ s say if a follicle is transected during fue but the bulb is left inside the skin. Will the bulb be able to regenerate into a new terminal hair? thanks. » skin. Will the bulb be able to regenerate into a new terminal hair? I thought the follicle was the bulb? But I know what you mean, and it’s a good question. I am sorry I am new to this. You know how the hair that grows upward out of the bulb (at the bottom), I assume if a fue transection takes place, the hair will get chopped off and the bulb at the bottom will stay in deep inside the skin, so my question is whether the bulb can regenerate a full terminal hair later on after the transection took place? Sorry I am still having a hard time explaining this, I don’t know the proper terms for the different parts of a hair follicle. » » skin. Will the bulb be able to regenerate into a new terminal hair? The strip was cut into “blocks”,of varying sizes, and each block is given to a tech. The number and size of the blocks is dependent on how many techs show up that day. IT IS THAT SIMPLE. AND THE BLOCK PRESENTED IS A VERY GOOD EXAMPLE. I have seen it hundreds of times when excising tumors or skin cancer from the scalp. A wide excision is neccessary and I often examined the tissue removed. So , in theory, they sticking together would not stop grieved patient/customer to proceed to discovery and proof if he thinks he is defrauded. Unfortunately, I do not recall under what circumstances this photo was taken. My goal was to simply help people appreciate how easy it would be for transection to take place. The profile shot illustrates very clearly that there is no margin for error under the skin. » that there is no margin for error under the skin. Correct… Now tell that to the megasession production line “experts” peddling their “numbers fraud”. » peddling their “numbers fraud”. In theory a lot of these problems have been overcome by Jim harris’s SAFE technique using blunt disection below the dermis. Would you agree? » » peddling their “numbers fraud”. » technique using blunt disection below the dermis. Would you agree? How does that work? Doesn’t Feller have a patented tool for fue too?